In the late 1940’s the numerous people in the Port Wallis area who were attending Woodlawn and Dartmouth churches were of great concern to the Rev. J.D.N. MacDonald, minister at Woodlawn United Church. In January of 1949 he requested of presbytery that a student minister conduct a survey to determine the United Church responsibility in the area northward from Dartmouth. The survey by Mr. Harold Cox of Pine Hill was completed in 1949. On 27 February 1950 an application was made by the Home Missions Committee of Presbytery for a student to serve Port Wallis. Student missionary Robert E. Butler of Pine Hill was charged to serve the Port Wallis area under the supervision of the Rev. J.D.N. MacDonald. Services began in the Community Hall (268 Waverley Rd.) with the first official board meeting being held 29 June 1950 in the Port Wallis School (263 Waverley Rd.). 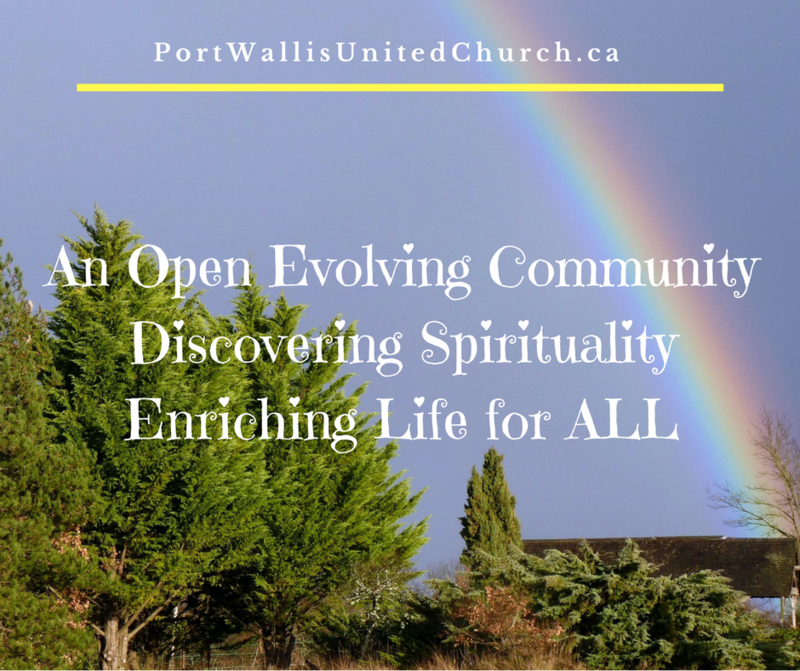 The meeting requested Presbytery to make Port Wallis a mission field of the United Church of Canada. The meeting also requested and was granted by the local School Board the use of the school for church services. On 26 February 1952 Halifax Presbytery recognized the Port Wallis congregation as a mission field of the United Church of Canada. The boundaries of the congregation would be that territory lying each side of the Waverley Road from Graham’s Corner out to and including the residence of Wm. A. Dalton, approximately two miles from Waverley, and would also include that part of Westphal lying between Waverley Road and Fourth Street. On 15 May 1952 Halifax Presbytery granted the congregation permission to purchase, for the price of $6000, the Port Wallis school building where the services were being held. Our present church hall was the sanctuary of the first church building. On 2 October 1952 the Home Mission Board voted a grant of $2000 and a loan of $2000 towards the purchase of the school. The service of recognition took place Friday 30 May 1952 conducted by the Rev. J.D.N. MacDonald assisted by Mr. Bruce Suitor, a student missionary from London, Ontario, who was serving both Port Wallis and Lake Echo. The Rev. J.W.A. Nicholson, a very interested and active leader in the early days of our church, lead in prayer. Mr. Nicholson served the congregation as supply without charge so that we might be in a better position to purchase the school. During 1952 three youth groups were organized: – C.G.I.T. under the leadership of Mrs. Neva Pennie, Explorers under Mrs. Eileen Stubbs and Mission Band under Mrs. Whidden. Student minister Douglas Earle served the congregation from November 1952 to June 1953 followed by Eric G. Fullerton from June 1953 to June 1955 under whose leadership the manse was built. The Congregational Meeting on 11 January 1954 elected five members to act as elders on the Session of the church: – Mr. John J. MacLeod, Mr. E. Henry Barry, Mr. Samuel J. Creelman, Mr. William S. Crooker and Mrs. D. M. (Neva) Pennie. Note that Mrs. Anne Marble has collected considerable historical data and memorabilia concerning Port Wallis United Church and some of her information, previously published in bulletins in connection with Anniversary services, has been used here. In addition, material was derived from the following verbatim transcription of some notes found in an old Sunday School register and probably written by Mrs. Neva (D.M.) Pennie. “The Port Wallis U. C. Pastoral Charge had its beginning through the interest and concern of Rev. J. D. N. for the numerous people in the area who were attending Woodlawn and Dartmouth churches. This concern prompted the Rev. MacDonald to ask presbytery. Jan 26/49 Presbytery minutes (Page 346) that the student appointed to Clarence Park be requested to share his time in Pastoral work by nature of a survey to determine the U. C. responsibility in the area northward from Dartmouth. The survey by Mr. Harold Cox of Pine Hill was completed in 1949. “February 27, 1950 an application was made by the Home Missions Committee of Presbytery for a student to serve Port Wallis. “Student missionary R. E. Butler of Pine Hill was charged to serve the Port Wallis area under the supervision of Rev. J. D. N. MacDonald. 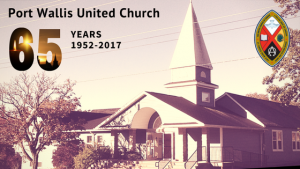 Services began in the Community Halle with the first official meeting being held June 29, 1950 in the school.3 The meeting requested Presbytery to make Port Wallis a mission field of the United Church of Canada. The meeting also requested of the Local School Board the use of the school for church services. “Feb. 26 1952 Halifax Presbytery recognized Port Wallis as a congregation of the U.C.C. with boundaries of the congregation to be that territory lying each side of the Dart. Waverley Rd. between Graham’s Corner and to and including the residence of Wm. A. Dalton approx. two miles from Waverley and also including that part of Westphal lying between Waverley Rd. and Fourth St. Westphal and that the congregation be established as a mission field. “May 15 1952 Halifax Presbytery granted the congregation at Port Wallis permission to purchase the school bldg where the services were being held. The purchase price of the school was $6000. “The service of recognition took place Friday May 30th 1952 conducted by Dr. MacDonald assisted by Mr. Bruce Suitor student missionary London Ontario presently serving the field. 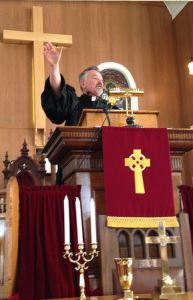 “Rev. J. W. A. Nicholson a very interested and active leader of the early church lead in prayer Mr. Nicholson served the congregation as supply without charge that the congregation might be in a position to purchase the school. The Oct 2nd 1952 meeting of the Home Mission Board voted a grant of $2000 and a loan of $2000 towards the purchase of the school building. While Presbytery gave permission for the appointment of a non-ministerial member to presbytery on Nov. 10 1952 there was no lay representative to presbytery until 1956. Presbytery minutes show for the first time on June 9th 1953 Lake Echo being part of the Port Wallis charge though Lake Echo was served by Mr. B. Suitor in 1952 and by succeeding leaders. Mr. Douglas Earle student of Pine Hill served the congregation from Nov. 1952 to June 1953 followed by Mr. Eric G. Fullerton June 1953 to June 1955. CGIT (Pennie) Explorers (Stubbs) and Mission bands (Whidden) were all organized in 1952. The Congregational Meeting Jan. 11 1954 elected 5 members to act as elders on the Session of the church. Mr. J.J. MacLeod, Mr. E.H. Barry, Mr. Wm. S. Crooker, Mr. S. J. Creelman and Mrs. Duff Pennie. 1957 Port Wallis Men’s Club donated $1500. On 8 February 1955, Halifax Presbytery agreed that the Port Wallis Mission field be changed to a Pastoral Charge with two appointments, one at Port Wallis and one at Lake Echo. A resolution was also passed that the charge be given permission to a call a minister. A call was issued to the Rev. William R. Seeley, D.D. who was serving at Bridgetown, N. S. at the time. Dr. Seeley accepted the call and became the first minister of the Port Wallis charge, where he served until 1958. It should be noted that in 1957 the Men’s Club of Port Wallis United Church were able to donate a sum of $1500.00. The Rev. S. Grant Walls succeeded Dr. Seeley and served until June 1964. During his pastorate a new electric organ was purchased, adjoining property was purchased to allow for future expansion and on 24 November 1959, the congregation began considering the desirability of enlarging the church building which was becoming quite inadequate. Shortly thereafter a building committee was formed and serious planning began. 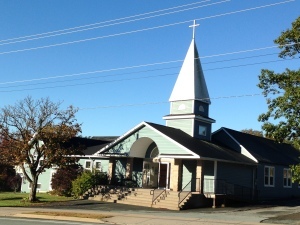 Plans for the addition and alterations to the old building were submitted by McCurdy Brothers Ltd., general contractors, and were approved by the congregation on 12 January 1964. Construction soon began and with volunteers helping where and when feasible. Mr. Walls left before the addition was completed, and was followed by the Rev. Albert N. Holmes who came out of retirement to help us in a difficult period. The work on the addition was substantially completed by November 1964 when we began to use the new facilities. With almost twice the accommodation of the old building, conditions were much improved for Church School, youth groups, suppers and other group activities. The new building was officially dedicated at 3:00 p.m. 25 April 1965. Mr. Holmes served us until 1968, when he retired a second time, and we called the Rev, Morley Bentley to our pulpit. Mr. Bentley remained only until 1970 when we found ourselves in the position of being unable to support a full time minister. At that time Halifax Presbytery arranged for a three year trial of sharing a minister with Woodside-Imperoyal United Church. The Rev. Ian Lynk served both congregations from 1970 to 1973, when he asked for a change of pastoral relations, and although Mr. Lynk was well liked, both congregations decided they were not really satisfied with the shared ministry. With the cooperation of Halifax Presbytery, an arrangement was made with Mr. Donald J. MacDonald, a second year student minister, to serve as our pastor with the Rev. E. Victor Moriarity as supervising minister. Mr. Moriarity was assisted by the Rev. Dr. J. D. Nelson MacDonald who had been instrumental in starting our congregation. Mr. Donald MacDonald stayed with us until his ordination in May 1975. We had hoped that Mr. MacDonald could remain with us as an ordained minister, but this was not approved due to United Church policy. Another Atlantic School of Theology student, Mr. Jeffro Bursey, replaced Mr. MacDonald and served as our pastor until his ordination in May 1976. A.S.T. student Mr. Ed. Scott served as summer supply following Mr. Bursey’s departure. After several years of being served by shared, retired and student ministers, our situation seemed strong enough that we could call a full time ordained minister, although we would still require some financial assistance from the Mission and Service Fund. As a result a Pastoral Relations Committee was formed in 1975 to look for a new minister, and in 1976 a call was issued to the Rev. S. Elroy McKillop from O’Leary, Prince Edward Island. Rev. McKillop served us faithfully and well along with his family, wife Carolyn and children Heather, Michael and Kathryn, until he decided to accept a call to Springhill in 1987. The Rev. Gordon Stewart, a retired minister, agreed to serve our congregation until we could find a new minister, and we greatly enjoyed his experience, wisdom and humour during his six months with us. Meanwhile, a new Pastoral Relations committee was hard at work seeking a new minister, who turned out to be our present pastor, the Rev. Ivan Gregan, who came from North River Bridge, Cape Breton. Mr. Gregan is trilingual (at least), so watch what you say in his hearing. As most of you know, Ivan was single when he arrived here, but in the summer of 1992 he took the momentous step of getting married, and we whole-heartedly welcomed Thelma into our midst. About this time our sanctuary was beginning to feel a little tight, especially on special occasions when we had to set up chairs in the hall to accommodate everyone. Also our Sunday School facilities were sadly inadequate, office space was cramped and space for meetings was at a premium. As a result a long range planning committee was set up to look at options for the future. It was rather informal at first, but as ideas began to gel, a formal committee was formed and the various congregational committees were polled for their ideas on requirements and priorities. Tours of several area churches, especially the newer ones, were arranged, discussions were held with architects and contractors, and a concept was born. One of the first tangible signs of things to come was a survey of the property and the expansion of our parking lot into an unused, heavily wooded part of the property. With the approval of the congregation, an architect was engaged to design an expansion of our present facilities to meet the needs recognized in the poll of the congregation. The resulting building design was organized in a way to permit the construction to be carried out in three phases as finances permitted if complete financing couldn’t be arranged. The financial campaign began and an ambitious schedule was proposed; but with the failure of obtaining some hoped for sources of financing, it was decided to go ahead with a phase one type of construction to provide Sunday School quarters and improved office and meeting facilities and new washrooms. Plans were drawn up, the congregation approved and the first sod was turned on 3rd May 1998. Construction began shortly after and was essentially completed, including landscaping, by mid-September, a couple of weeks behind schedule due to some unplanned for problems. The congregation provided considerable ‘sweat equity’, especially in the landscaping and site cleanup, both inside and out. The Sunday School began to use the new facilities on the last Sunday in September with an enrollment of about 80, and the offices and new meeting room were occupied during the last week of September. An Open House and the Dedication ceremony were held on Sunday 4th October 1998.
and the partitions in the lower hall were removed to make a large meeting or recreational area which is well used by children’s groups. The downstairs washrooms were also renovated. At this point the church didn’t have a new steeple and the original plans were deemed unsuitable for various reasons. After two years of discussions, fund raising, looking at other churches and planning, a new steeple was built at a remote site during the summer and fall of 2000 and lifted into place in December 2000. Up to this point, the sanctuary and hail were unchanged and at times accommodations were still rather tight. Attendance at both the 9:30 a.m. and 10:30 a.m. services continued to grow and by 2003 it was decided, with our indebtedness considerably reduced, to reactivate the Long Range Planning Committee. A new brochure was prepared inviting the participation of all members and groups of the congregation to become involved in the planning of this next phase of & expansion. 1 ‘The name of Port Wallis was changed to the more historically correct Port Wallace in the 1960s(?). The church retained the old spelling for legal reasons.